Creamy oil in home conditions is made from cream, only need to use the authentic product, not what is sold in supermarkets. Buy from farmers three-liter jar of milk. 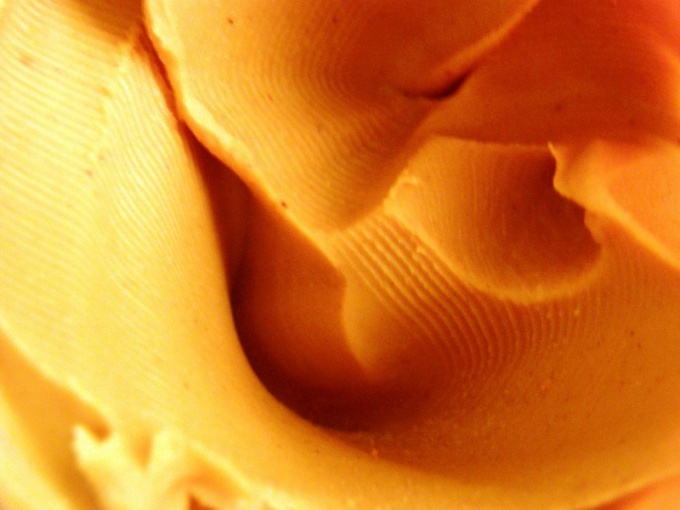 It is a sediment, formed on the surface of the cream. Of them get pure oilwhich contains vitamins and is easily digested. But it is sensitive to light and heat, which increase its acidity, there is bitterness. Oil deteriorates, becomes unfit for food. Refrigerate the jar with a rustic milk and leave overnight. In the morning you will see that the top was formed, the thickening is stood off the cream. It was the fatter the milk, the thicker will be the layer of cream. Remove the thick layer from the surface of milk wide spoon with holes. Leave the Bank a little cream to your milk is not there are very low fat. Put the cream into the bowl of the mixer. Leave for 15 minutes, the mass has acquired room temperature and whipped. Turn on the mixer first on slow speed. Periodically looked over by the process. When the cream will be whipped and becomes smooth, increase the speed of the mixer. You will find that in cream oil flakes are formed and separated white liquid is buttermilk. It can be directly drained into another container and use for baking, and can be left until the end of the process. Beat butter mass until then, until big oil ball and, separately, buttermilk. Press the butter with your hands and put in a grease gun or wrap in wax paper. For long-term storage , the oil can be rinsed. To do this, drain the buttermilk, the resulting piece of butter cut into small pieces and pour boiled water. Turn on the mixer. The water will become white. These are the remains of the buttermilk. The operation by pouring water to swipe several times. Bowl for mixer fill with cream just before the half, when the mixture starts to flake, then buttermilk can result in the edges of the bowl. Mix soft butter with other ingredients. Add finely chopped fresh herbs, garlic or ginger. You get a flavored butter.